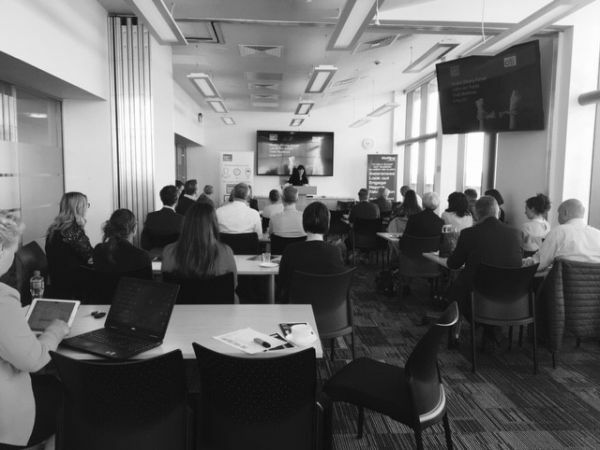 On Tuesday 23 May; Business in the Community organised an event focused on Modern Slavery, Forced Labour and Supply Chain Resilience. The event was kindly hosted by Citi bank in its impressive Titanic Quarter Headquarters. This event was designed at the request of Business in the Community members, responsible businesses who are determined to address this pertinent and topical issue. Speakers from Citi, A&L Goodbody and the Law Centre expanded on the legislative requirements of the Modern Slavery Act and recent research they commissioned which compared how issues of modern slavery were dealt with across various jurisdictions in the EU. The research showed that the UK has taken a considerable step in the right direction with the Modern Slavery Act, but has a long way to go in bringing awareness and prosecutions to levels that impact on the forced labour black market. Those attending heard how companies, not only those with a turnover exceeding £36 million who are legally required to comply, but those further along the supply chain are being tasked to conform through tenders, etc. Sean Grego from Citi urged attendees to be aware of the breeches in NI and in their supply chains further afield, and to at least start the process of mapping their possible supply chain weaknesses. Kerry Kelly from Staffline Ireland spoke about the ways to safeguard your recruitment practices from forced labour situations and shared a red flag document which outlines the signs to spot those in forced labour. Glenn Bradley from Hardscape brought the attendees through the journey his company has been on to strengthen their supply chain, how breeches in Human Rights in the supply chain led the company to invest in boots on the ground to work with the local communities to change the culture away from the likes of child labour. Since then they can say that tier one is compliant with the Ethical Trade Initiatives base code and they are working on influencing lower tiers also. The Modern Slavery Act 2015 was passed in the UK in March 2015. Modern Slavery is the term used to describe slavery, servitude, forced and compulsory labour and human trafficking. It is estimated that 45.8 million men, women and children are trapped in some form of modern slavery. Trafficking is the fastest growing form of international crime and the 3rd largest criminal industry after drugs and arms trafficking. Through the Transparency in the Supply Chain clause, companies with a turnover of £36 million or more (operating in any part of the UK, regardless of where they are headquartered) are now required to publish an annual anti-trafficking statement from March 31, 2016, signed by a Company Director. In this statement, companies must disclose the steps taken to mitigate the risk of human trafficking and modern day slavery in their supply chain. The statement must be available on the company website with a link to same on the homepage. If a company is taking no steps to prevent human trafficking then they must also issue a statement to that effect. This regulation will require all European Companies manufacturing or importing conflict minerals components, to perform due diligence on their supply chain and report on the origin of conflict minerals used in their product. The regulation will cover the sourcing of conflict minerals from anywhere in the world. The EU Non-Financial Reporting Directive has to be transposed into Irish law by December 2016. This Directive will require large public-interest entities, with more than 500 employees, to disclose in their management reports, relevant information on their policies, risks and outcomes relating to environmental matters, social and employee aspects, respect for human rights, anti-corruption and bribery issues and diversity in the board of directors. The Anti-Tax Avoidance Directive proposes six legally-binding anti-abuse measures, which all Member States should apply against common forms of aggressive tax planning. European Commission’s Proposal on Shareholder Rights. The objective of the current proposal is to create an attractive environment for shareholders by improving the efficiency of the equity investment chain & contribute to growth, job creation and EU competitiveness. It will also promote understanding of the value of a more long-term perspective and will enhance transparency to ensure better operating conditions for listed companies. Every member state will be required to write this into local law, so companies need to be aware that it is coming. UN Guiding Principles on Business and Human Rights (UNGP) known as the “Ruggie Principles” after UN Special Representative John Ruggie who proposed the UNGP. This is a set of guidelines for countries and companies to prevent, respect, address and remedy human rights abuses committed in business operations. This offers guidance to companies on how to report on human right issues in line with their responsibility to respect human rights (set out in the above UNGP). The framework comprises a set of questions, and guidance on how to answers the questions, about a company’s human rights policy, practices and performance. Both Marks & Spencer and Unilever have used the UN Reporting Framework when writing their first human rights reports in 2016. Both companies look at salient human rights issues over material ones. For Unilever, using the salient lens instead of materiality resulted in new and different issues being highlighted g. land rights and sexual harassment. Collaboration is key. Both companies work with external human rights experts and organisations. Both companies work with their suppliers in a strong partnership model and this helps in capacity building and successful programme implementation in the various supply chain tiers. Grievance mechanisms – the Unilever team noticed an increase in complaints about breaches in the code of conduct from 2013 to 2014 after doing work on this area. After assessing this rise, Unilever has taken this as a useful statistic to show an increase in awareness in what constitutes a breach of conduct. The UNGC is a voluntary initiative based on a CEO level commitment to corporate sustainability. Being part of this initiative requires a call to action to align company strategies and operations with universal principles on human rights, labour, environment and anti-corruption, and take actions that advance societal goals. The OECD Guidelines for Multinational Enterprises are a set of government backed recommendations for responsible business. The guidelines aim to encourage the positive contributions that multinational enterprises can make to sustainable development and are consistent with relevant laws and internationally recognised standards. The Corporate Human Rights Benchmark (CHRB) is the first-ever ranking of the world’s largest publicly listed companies on their human rights performance. It is currently in its pilot phase. The 2016 pilot benchmark will rank the top 100 companies in the agricultural products, apparel, and extractive industries. EcoVadis aims to improve environmental and social practices of companies by leveraging the influence of global supply chains. EcoVadis operates a collaborative platform providing supplier sustainability ratings and performance improvement tools for global supply chains. The platform delivers scorecards to monitor supplier practices covering 150 purchasing categories, 110 countries, and 21 CSR indicators in four themes: environment, labour/human rights, ethics and supply chains. The CIPS Sustainability Index benchmarks suppliers’ organisational sustainability. It offers a cost-effective online assessment of environmental, economic and social sustainability. The Index gives buyers a better view of their supply chain and reduces supplier risk; it enables suppliers to demonstrate excellence in sustainability strengthening information with customers and supporting new business bids. Use a cross-functional approach to develop the company’s human rights policy & governance structure. Get agreement on what is meant by human rights for your company and seek to fully understand the chain of supply, particularly where the risks and vulnerabilities are further down the chain. In locations where bribery & corruption issues are rife, the same is usually true of modern day slavery and poor labour practices. Consider the categories over which your company has the most influence, the highest spends, the countries of origin, and if there was an issue, what would most impact the reputation of the brand. Engage your suppliers and explain why you are asking the questions and what you are doing to do with the information – it is about identifying possible risks and addressing them. If you have particular concerns, find a way to get to the voice of the employee. Worker surveys are better than audits, particularly anonymous ones. Talk out your challenges with your trusted advisers, draw on the above guidance material, roll-out relevant training and be open to learning from other companies who are doing this longer and collaborate. Collective action can lead to system chain. CEO Breakfast Forum: Who has responsibility for leading Northern Ireland?